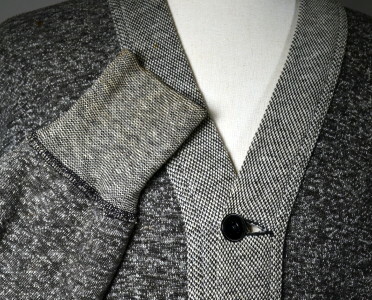 SALT & PEPPER 1930's/40's vintage SPORTSWEAR V-neck cardigan sweater. Heathered gray and white cotton fleece, black & white tweedy textured cotton edging and gray & white chevron knit cuffs. Contrasting edging at neck, button placket and pocket banding. Two patch pockets lower. Original black celluloid fisheye buttons, all present. Contrasting cuffs applied with black overlock. Shoulder, measured from seam to seam across top of back yoke with dropped shoulder - 23"
Sleeves, measured from dropped shoulder seam to cuff edge - 22"
Center back length, measured from top neckline edge to hem edge - 25"
Excellent condition. Shows general slight discolor and wear, light fade at right shoulder.